T-Shirt, 5 drinks (1 per bar), and food and drink specials are included. 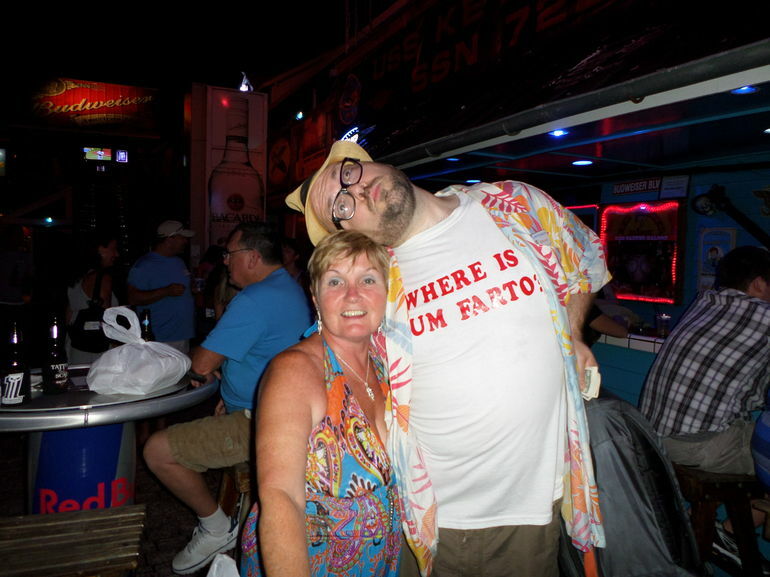 Spend over 2 hours touring the many lively bars that Key West is so famous for with the Key West Pub Crawl. Your tour will take you to some of the most famous drinking spots in all of the Florida Keys. You'll begin at Whitehead Street which is located downtown. From there you'll be taken to all of the hottest and most entertaining bars in the area where you'll witness masters of mixology as you wind your way thought the keys. Each bar offers new opportunities as you'll be treated to your choice of a complimentary mixed drink or beer. Weather you are looking to take in the amazing atmosphere the Florida Keys are known for, listen to amazing live music, or treat yourself to amazing Caribbean drinks, this tour offers a little something for everyone. Each tour guests even gets their own free souvenir shirt to remember the amazing time you had. This tour requires a moderate amount of walking, please dress appropriately for the weather and wear comfortable footwear. Reservations are required for this activity. Your tour includes a knowledgeable guide to take you to all of the most popular locations. Due to the nature of the tour, guests should be 21 years of age or older. Enjoy all the popular hotspots that are known for their fantastic drinks and lively atmosphere when you do the Key West Pub Crawl. If you're looking for the ultimate Key West experience, join the 'Duval Crawl' pub crawl! Key West is famous for its lively bars. Though a small island, the pubs and bars are always a huge hit, day or night. On this exciting pub crawl, experience some of the most famous and entertaining drinking spots in the Florida Keys! This exciting 2.5-hour Key West pub crawl begins at Whitehead Street downtown. Hit the most entertaining and famous bars in the Florida Keys and experience the masters of mixology as you move through the historic seaport. Everyone will have a choice of a domestic beer or mixed drink at each bar. You will also receive a free souvenir T-shirt to commemorate your party in paradise! Try the famous Caribbean Breeze at Rick's if you dare! Whether it's the casual Keys atmosphere, live music or exotic Caribbean drinks you are after, your Key West pub crawl experience will be an adventure to remember.